Located in Barcelona (Sant Marti), Hotel SB Diagonal Zero Barcelona is within a 10-minute drive of Platja de Llevant and Nova Icaria Beach. This 4.5-star hotel is 3.7 mi (6 km) from Sagrada Familia and 4.1 mi (6.6 km) from Casa Batllo. Grab a bite to eat at one of the hotel's 2 restaurants, or stay in and take advantage of the 24-hour room service. Snacks are also available at the coffee shop/café. Unwind at the end of the day with a drink at the bar/lounge or the poolside bar. Buffet breakfasts are available daily from 7:00 AM to 10:30 AM for a fee. Pamper yourself with a visit to the spa, which offers massages, body treatments, and facials. If you're looking for recreational opportunities, you'll find a health club, an outdoor pool, and a spa tub. Additional features at this hotel include complimentary wireless Internet access, concierge services, and a television in a common area. Guests can catch a ride to nearby destinations on the area shuttle (surcharge). Featured amenities include complimentary wired Internet access, a business center, and express check-out. Planning an event in Barcelona? This hotel has facilities measuring 5382 square feet (500.00 square meters), including a conference center. Self parking (subject to charges) is available onsite. 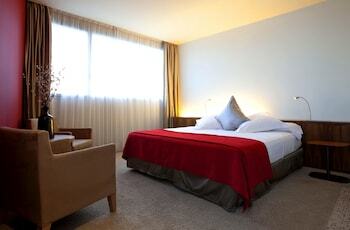 Make yourself at home in one of the 262 air-conditioned rooms featuring microwaves and flat-screen televisions. Wired and wireless Internet access is complimentary, while MP3 docking stations and digital programming provide entertainment. Private bathrooms with bathtubs or showers feature rainfall showerheads and complimentary toiletries. Conveniences include phones, as well as safes and desks. - Spa The above list may not be comprehensive. Fees and deposits may not include tax and are subject to change. Cash transactions at this property cannot exceed EUR 2500, due to national regulations. For further details, please contact the property using information in the booking confirmation. Reservations are required for massage services and spa treatments. Reservations can be made by contacting the hotel prior to arrival, using the contact information on the booking confirmation. Some facilities may have restricted access. Guests can contact the property for details using the contact information on the booking confirmation. Guests can arrange to bring pets by contacting the property directly, using the contact information on the booking confirmation (surcharges apply and can be found in the Fees section). We understand that sometimes your travel plans change. We do not charge a change or cancel fee. However, this property (Hotel SB Diagonal Zero Barcelona) imposes the following penalty to its customers that we are required to pass on: Cancellations or changes made after 11:59 PM ((GMT+02:00)) on Apr 22, 2019 are subject to a 1 Night Room & Tax penalty. If you fail to check-in for this reservation, or if you cancel or change this reservation after check-in, you may incur penalty charges at the discretion of the property of up to 100% of the booking value.